Every night in the hospital – especially nights when I’m alone with Namine – it reminds me of those first days, so scared of everything I didn’t know. The very first night I stayed with her by myself was a test. Literally, it was a test that I had to pass, in order to prove that I had learned how to care for my fragile daughter. Every other time, I had had Jessica to lean on; always the stronger, she was my support, my strength through those hard, dark days. Of course the nurses were only an intercom press away. But to know that more rode on my performance: the knowledge that I was fit to be trusted to care for my daughter, my little one that I professed to love so much. Now those words would be put to the test, validated, confirmed with undeniable action. Of course I did fine. But oh, how nervous I was! 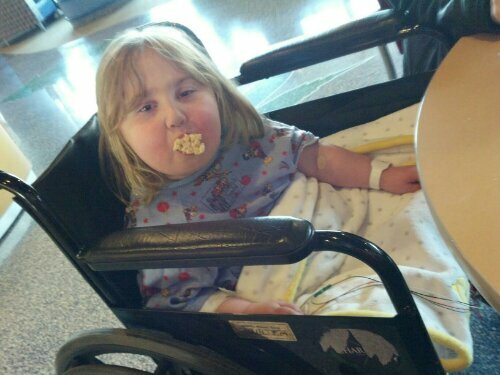 And more medically stable though Namine is, hospital stays are never much easier. Of course I’m not nervous about being here anymore, and I have no problem whatsoever calling doctors and nurses out on where they’re wrong, but when we’re here, it’s because we can’t do enough for her at home. So we always long for the day, each time, no matter how seasoned a hospital veteran, for the day when we can go home once again.